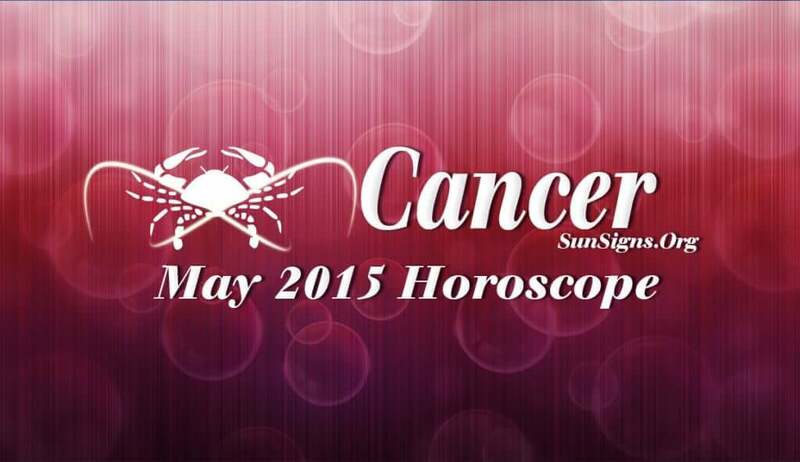 Cancer May 2015 Horoscope predicts that this month will bring in major changes which will affect you over a long period. It will cover all aspects of your life like career, relationships and spirituality. Your planetary placements might come in the way in your path to success. You need not worry about interference from others. Just bulldoze your opposition. Majority of the planets are in the upper half of your horoscope indicating career issues will dominate over family and psychological personality. Planets will maintain harmony in the family and nothing much needs to be done from your side. The Cancer career horoscope for May 2015 foretells that professionals involved in jobs dealing with communication skills will excel. Progress in business will be slow as planets are moving slowly. Job changes are likely during the month. The Crabs should finalize all financial deals after 20th May 2015. Review your strategies and make necessary corrections. More effort has to be put in to earn money in the first half of the month. Get a Vedic astrology Indu Lagna prediction for money and fortune. In May 2015 single Cancerians will have abundant opportunities to find romantic partners. Love is to be found in social meetings or when involved in humanitarian work. Here are a few tips on how to win over your woman. Children should be ready to face long term changes in their life. Your emotional compatibility with your partner will be excellent. Pregnant Cancer women will be blessed with a blissful month. Overall health will be good for the Cancer zodiac sign in May 2015. You should restrict your activities to conserve energy depending on the phases of the moon. Try these home remedies for depression, if you are feeling a little blue.